Here, we have corroborated a few pertinent points that are actually lesser known. We’ll also take in account whether or not a given strategy is fool-proof and if it requires integration with other strategies for recovery. Ever since 2011, when Google brought in its first Google penalty called Penguin, the domain has been piled up with rumors around what they are and how they affect. We have covered these topics in detail in our blog and through our SEO FAQs. Here our focus will be to tell you how misinterpretations can hamper your penalty recovery prospects. Here, we have corroborated a few pertinent points that are actually lesser known. We’ll also take in account whether or not a given strategy is fool-proof and if it requires integration with other strategies for recovery. We assume that your website is under penalty. It’s fading at its charm. Its traffic is almost dead. Your concern is obvious. You approach an agency that assures you to do the needful to get you recovered from the penalty. 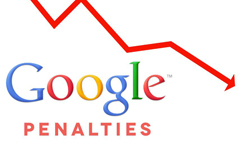 They crop up a Google penalty recovery plan with a step-by-step process and start working on them. They are might be on the right track, or being a layman to their plan, you’ve no choice but to believe that they’re right. So, what’s the need to write this post? Google Search Console (Earlier Google Webmaster tool) does help you in having a quick insight into your backlinks, but under its limits. The tool, unfortunately, doesn’t record all of the current or historic backlinks pointing to your site. Means, if your agency is relying only on GSC to collect bad links, you can confront politely. Please note, there are many advanced tools beyond GSC available to record your historic links. Moz Open Site Explorer, Majestic SEO, ahrefs and LinkResearchTools are a few names that you can utilize to weed bad links out. I know many marketers whose websites somehow managed to escape the clutches for longer even with the bunch of bad backlinks pointed to their website. But Google tracked them, lined them up and penalized them. A bit delayed, but it finally happened. If your website is in possession of bad links, you will not be spared, though, it could take some time depending upon when Google crawlers and algorithms detect you. Since Google Engineers manually scan websites for guideline violations, your turn could be delayed due to longer queues. However, Google algorithms run round the clock, and therefore, you can get flagged for review anytime. So, what to do for quicker? Don’t try to dodge Google. If you know there is something wrong with your backlinks, act promptly and remove the unnatural back links. In this way only you can reduce the collateral damage. Among many shortcuts that webmasters employed during the initial days of penguin, the relaunching of website onto a new domain was a noted one. At that time, webmasters moved their content and code into a new site OR 301 redirecting their whole site including backlinks, website code and content. The strategy worked for some and resulted in discarding the penalty. However, the strategy didn’t last long. A few weeks later, Google slapped them with massive penalty and their rankings knocked down badly. Google has inbuilt algorithms to detect private blog networks. This is how search giant link domains together and de-index them. Domain migration and routing to 301 could help you manage the mess for shorter span, but in the long term you’ll get detected and slapped. If Google revokes a sitewide or partial match manual action revoked after considering your well-written reconsideration request, it does not mean you’re in safe zone. Google might have made this time bound judgement after seeing your website in Good terms with Google. But you need to understand that you couldn’t succeed in removing bad links entirely. As you built them in the past on a large scale to gain ranking boost, you still have skeletons in the closet. If Google again detects fishy link behavior on your website, you could be penalized again. Even if you’ve been hit by a manual penalty earlier, you’re still on Google’s radar. Do you know what annoys Google the most? A website, that buys or sells backlinks. Google hates to see links being sold or bought for the sake of improving page rank, domain authority and rankings. Google has a well-written document on good and bad link exchange practices. If in the past, you allowed paid links on your website or exchanged links by dodging Google guidelines, you could be in serious trouble. So, when Google slaps, auditors start removing those links they have acquired in the past. That’s not really needed. We have a better idea for you to go with. If your links send considerable traffic to your website, let them be there with a ‘no-follow’ tag. Likewise, if they are or will be contributing factors to the penalty, you should remove them. It’s merely an assumption that all low authority bad links harm your website. If a low quality link belongs to a good website with no bad history, it could help you rank well. If you manage to get plenty of low quality links from the websites that have good reputation in the eyes of Google, needn’t to remove them fearing Google penalty.